Well i guess christianity is to prefer over going to niflheim here. I always get a kick out of Loki . There were nordics at the time of christianity? I always thought they came way before. Haha! Oh yeah, there were Christians. Many Christian monasteries were attacked and plundered by vikings because they were easy targets. The people there were pretty defenseless and weak and easy to overpower and/or kill. Also most of the best loot was kept in monasteries. Mhnn it coexisted for quite some while. In the end however all the kings decided to get christian and forced the rest of the country to become christian at swordpoint. Haha, yep. TMK isn’t quite that far into it, but not too far behind either. So this must have been about the time when they were just starting to covert and there was a lot of mix in traditions. Is there any general reason the mast is broken? Or is it a story you intend to tell? I got here from a link on the Meek! 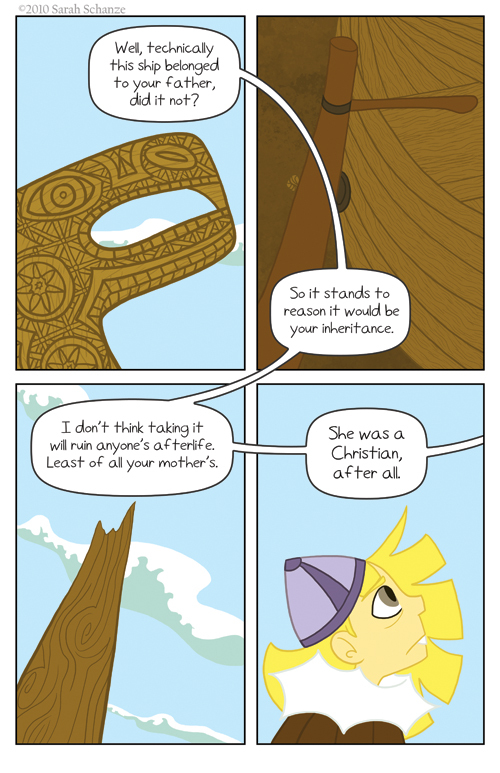 This webcomic is very, very interesting and I *so* look forward to following it from now on! I adore this comic so much. Oh and I linked you over at my site! Helping spread the Coal love! I just found this comic tonight and devoured the archives–and I’m really excited about what’s to come. I love the personalities of all the gods, and your designs for all the characters are simply stellar. (Well, except for Thor being blonde and slender. ;)) You have an amazing eye for comic work! Thank you Heimdall! Haha, Heimdall…we’ll probably be seeing “you” later. ;D And yeaaaah I think I designed Thor before I really started reading the myths and by the time I realized he was essentially a red hairy boulder it was too late. D: Next time! Discovered ya through Wayward Sons, and I just finished reading through all of TMK! Well done, Sarah! Loki is my favorite god and you have captured his feel nicely!